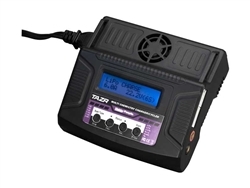 The TAZR Multi-Chemistry charger is a high-performance, micro-processor controlled charger/discharger with built-in lithium cell-balancing. The TAZR is suitable for charging LiIo, LiPo, LiFe, NiCd, NiMH, and Lead Acid (Pb) batteries from an 11-18V DC or 100-240V AC power source. With a maximum internal circuit output power of 50W and a variable charge current of up to 6.0A, the TAZR is a versatile and easy-to-use charger that works with most batteries used in the hobby today. The TAZR also has cycling and discharging capability. XH balance ports are built-in, so balancing lithium packs is easy. And of course, adapters are available if needed. A separate optional temperature sensor is available for added security. SAFETY: It is VITAL that the TAZR be used properly. • Only use the charger with the intended battery types. • Only use the charger under supervision. Never leave the charger unattended. • Double check all connections before starting the charger. • NEVER charge hot or damaged battery packs. • Keep the charger dry. • Do not use a wet or damaged charger.